You read that right! Not one book, but two! Rebellion and Resistance will be the fifth and the sixth novels of the Jack Randall series, as well as first and second novels of The Twelve Shepherds saga. If that sounds a little confusing, let me explain it to you. There will be a new saga, The Twelve Shepherds, which happens inside the Jack Randall series’. It’s like a series within a series! Haven’t you written a The Twelve Shepherds series already? The readers who pay close attention to what I write will know that we had a The Twelve Shepherds series before, which had several small books, each one considered an episode. But then, as I explained in this blog post, most readers expressed that they would prefer the story to be told in the novel format instead. So, I asked my team to unpublish the books in the serial format and I’ve converted them into the novel format! What if I have already read The Twelve Shepherds in serial format? 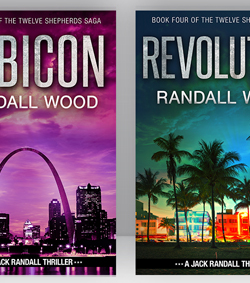 If you had the chance to read fourteen Twelve Shepherds episodes back when they were out there, you’ll find that you’ve already read most of the content of these two books, Rebellion and Resistance. However, I’ve added some extra scenes here and there, organized this and that, and basically tightened up the story, so you may want to give them another read! When can I read these two books, then? Good question! My team and I are hammering out the final details of the publication of these two books, but we hope you’ll have a chance to read them around September 14th! Of course, when they are out, I’ll send an email notifying you, so maybe you want to keep an eye on your inbox. So, let me know if you enjoy these two covers. I think my designer did a great job once again! PS: Even if you think the few extra scenes and modifications aren’t worth you getting these two books in the novel format, don’t worry! There will be more new books coming out very soon! If you have any questions or comments, please send them and I’ll personally help you out.